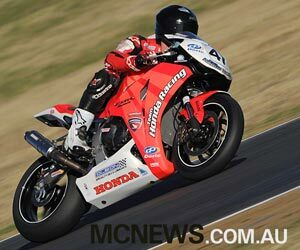 Team Honda’s Jamie Stauffer defied the disappointment of a DNF yesterday to win the second race of round 6 of the QBE Australian Superbike Championship at Queensland Raceway today. 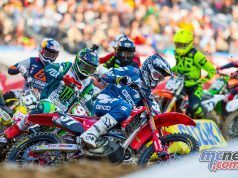 Stauffer led the 14-lap clash from pole, treading carefully on a low-grip circuit as he fended off a race-long challenge from Team Suzuki’s Josh Waters. Stauffer and Waters engaged in a battle of the late brakers, with Waters attempting but unable to convert a number of moves for position at the end of the circuit’s 280km/h back straight. Stauffer redeemed himself after yesterday’s dramatic crash to take the chequered flag by 2.262 seconds and his third race victory from four starts at Ipswich. Third place went to a consistent Ben Attard, who put his i-Style The Natural Aprilia RSV4 on the podium in both races this weekend. The overall round 6 victory fell in favour of Stauffer’s Honda teammate, Wayne Maxwell, who backed up his race win yesterday with fifth today. Maxwell lacked the front end confidence to push forward during the race but was relieved to bag more valuable points after a rollercoaster year. Procon Maxima BMW rider Glenn Allerton was unable to challenge for a race podium today but pushed on to finish fourth, snaring second overall for the round. The result marks Allerton’s first non-podium finish for the season, an incredible statistic which sees him sitting comfortably atop the standings as the ASBK looks ahead to its penultimate round at Symmons Plains in November. The BMW rider’s points lead extended to 67 today as the battle for positions 2 through to 6 tightened considerably. By virtue of his pole position point, race win and DNF, Jamie Stauffer remains in second but is joined by Attard, with both riders sitting on 196 points. Team Suzuki’s Troy Herfoss holds onto fourth place despite a disappointing run this weekend. He survived a run through the gravel trap at the end of turn 3 today to salvage 9th for the round. Craig Coxhell may not have had the pace of the podium placers but rode consistently today to maintain 5th on the standings, 4 points ahead of a charging Wayne Maxwell. Prostock Challenge honours went to BMW rider Linden Magee, who held off Team Suzuki’s Brodie Waters and local Honda rider Nathan Houtermann in identical race and round results. QBE ASBK action resumes at Symmons Plains for its third 2+4 event of the year on November 11-13. *Results provisional at time of publishing. 1521 – Team Honda’s Paul Free has responded to BMW’s protest with one of their own… More to come….. Later, probably much later… Ciao for now! 1426 – Lapped traffic may decide this race, it won’t be long before the race leaders are threading their way through slower riders…. 1418 – The order as they start lap two is Jamie, Josh, Ben, Glen, Troy, Wayne and Robbie. 1416 – Stauffer gets a good launch, Attard also but Jamie leads them through turn one where Attard also got swallowed up by a couple of Suzukis…. 1414 – They’re away on their warm-up lap now, only a couple of minutes away from a race start…. 1412 – Tyre warmers coming off now..
1342 – Track is mainly dry at the moment but rain could come at any time. I spoke to Mark Trounson from Procon Maxima BMW about the electronic tweaks that are available to them to aid Glenn Allerton should the rain indeed come down for this bout.